Canadian brewery Moosehead donated $25,000 to increase the height of ‘Mac the Moose’ in order to regain its title as the ‘world’s largest moose’, a crown it lost to a Norwegian competitor in 2015. 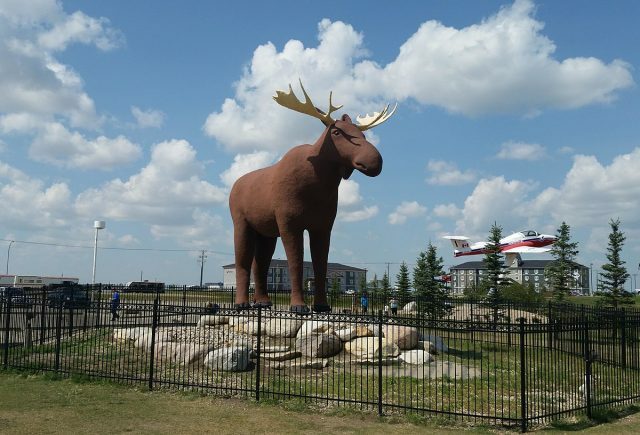 New Brunswick-based Moosehead has announced a partnership with the mayor of Moose Jaw to restore the town’s moose sculpture, affectionately known as Mac the Moose, to its former glory. At a height of 9.8 metres, Mac was once the world’s largest moose, but lost his crown when Norway erected Storelgen, that surpassed him by 30 centimetres. Vice president of marketing and sales at Moosehead Breweries, Trevor Grant, told Calgary Herald: “We’ve never been one to back down from a fight, and we do recognise that same resilience and sort of fighting spirit in Mac the Moose. Grant told the site that the moose symbol had been used in the brewery’s branding since 1933 when it created a Moosehead Pale Ale. Canadian social media stars Justin and Greg launched a $50,000 Go Fund Me Campaign which has since amassed bids totalling $12,876. Mayor of Moose Jaw, Fraser Tolmie, and deputy mayor of the Norwegian municipality of Stor-Elvdal, Linda Otnes Henriksen, have also got involved. It is believed the money will be spent on lengthening Mac’s antlers and carrying out some more general restoration. Built in 1984, Mac stands on the grounds of Moose Jaw’s visitor centre. Meanwhile, Storelgen, translated as ‘the big elk,’ is located on Norway’s E3 route and was constructed in 2015 by Norwegian artist Linda Bakke.